Ruth, Arran and I had an absolutely lovely weekend away in the Lake District for Easter. Once the swing got going they were both happy. ...resulted in grins of delight from both boys. Later, Arran had a go on a different swing on his own - he loved that too! 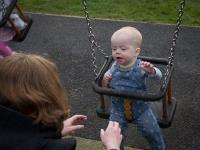 Arran also tried going on a swing with Ruth, which they both loved. He even tried quite a grown-up swing on his own. He's not quite ready for that yet. His toybox is a fire engine, so the watering can is appropriate. We had special Easter Crackers with lovely yellow easter hats. 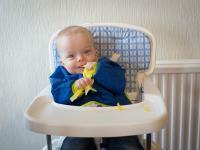 Arran wore his for about 20 seconds before shredding it and trying to eat the pieces. Easter Sunday brought beautiful weather so we went out for a nice long walk through Bowness and some nice forrest along to Windermere. This was just going to be another one of Arran and I, but Su said "Can we be in your selfie" and photo-bombed me! Arran's first go on a climbing frame - and it was shaped like a train. He did some good holding on. The higher he goes, the bigger the grin!